A new compact crossover from Suzuki - the Ignis - will start at £9,999 OTR. That’s for the 5-speed manual SZ3 model, while the SZ-T 5-speed manual - which adds sliding rear seats, satellite navigation, rear view camera, wheel arch extensions, 16-inch alloy wheels, side mouldings and roof rails - starts at £11,499 OTR. All new Ignis models are powered by the same Dualjet 1.2-litre engine, however the SHVS SZ5 model has a mild hybrid system (Smart Hybrid Vehicle by Suzuki) with CO2 emissions of 97g/km and combined fuel consumption of 65.7mpg. Prices for the hybrid start at £12,999 OTR while the range tops out at £13,999 OTR for the hybrid with all-wheel-drive. A non hybrid SZ5 model costs £13,799 OTR. The SHVS system only uses its conventional engine starter motor when first started from cold, under all other conditions it uses the ISG unit to allow smooth and quiet engine restarts. The energy assistance provided during acceleration enables the SHVS to be known as a mild hybrid system which is ideally suited to a compact car and adds just 6.2kg to the overall weight. The Ignis features a ‘distinctive’ front face that integrates the LED headlamps and the ‘strong lines’ of the front grille, says Suzuki. It inherits the first-generation Cervo’s slit-like ‘C’pillar design cues and also the Swift’s blacked out ‘A’ and ‘B’ pillar design. Suzuki’s new generation platform minimises the size of the engine compartment, which has enabled maximising the space available for cabin occupants and luggage. Within its compact body size, Suzuki says the Ignis features a ‘roomy and comfortable’ cabin with 267 litres boot space (SZ3), (204 litres for ALLGRIP model utilising a rear differential). the sliding rear seat functionality, combined with the ability to fold down the rear seatbacks, makes it possible to accommodate a wide variety of luggage. Boot space increases to 514 litres with both rear seats folded and can be as high as 1,100 litres if fully loaded to the roof line. 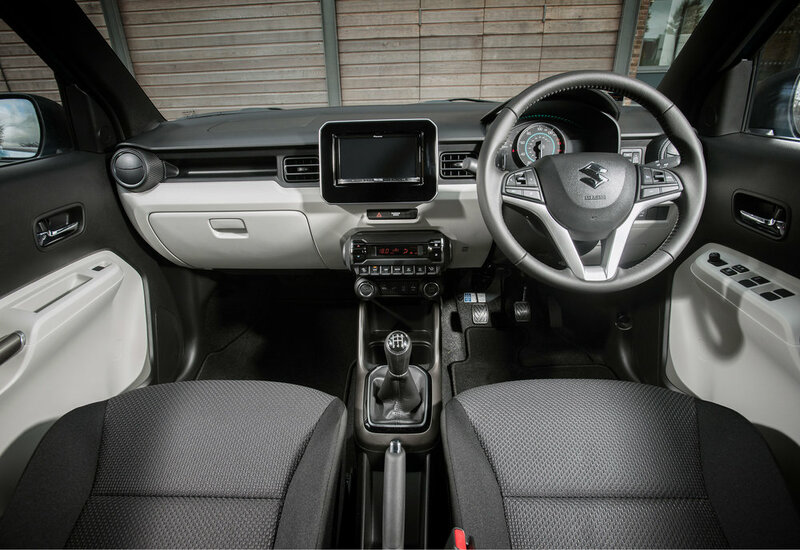 Standard equipment for the entry SZ3 model includes six airbags, air conditioning, DAB radio with Bluetooth, 15-inch wheels, body coloured door mirrors, front electric windows and five seat capacity. SZ-T models get the aforementioned spec, while SZ5 modes add auto air conditioning, Dual Camera Brake Support, keyless entry and start, rear electric windows, LED Headlghts with DRL and front foglamps. The new Suzuki Ignis goes on sale in the UK from January 2017.